We have been helping Orlando, FL with their jet-vac & vacuum truck sales and repair needs since 1985. Aquatech Jetvac Repair–From large cities to small towns or contractors, everyone needs some assistance with their equipment, and that’s where Aquatech Jetvac comes in. 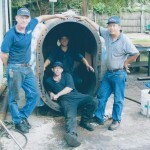 Here at Pat’s Pump & Blower, Aquatech is just one of the many equipment brands we sell, service and repair. Aquatech is an industry leader for their advanced design systems. The Aquatech Jetvac offers front and rear reel design, single engine and a positive displacement blower for peak performance. Let us arrange a demonstration at your location with one of our products from Aquatech. Vacuum Blower Repair– When you are in need of vacuum blower repair, lost time can mean lost customers! We want our clients to know that they come first, so we offer 24-hour services in addition to on-site repairs for your convenience. Oftentimes, because our staff consists of skilled machinists, we can complete a vacuum blower repair job right. Don’t let a vacuum blower repair need put your business in jeopardy! Not only do we offer repairs, but we also are distributors of some of the best names in pumpers and blowers. No matter your location ,we have the fastest turnaround for repair and are very cost effective. Vacuum Pump Repair–Whether you need a small job done on a vacuum pump repair or a complete overhaul on a larger turnkey system, Pat’s Pump & Blower guarantees that we can get the job done for you! We offer our services for many brands, such as Masport, Fruitland, Jurop, Battoni, Conde, NVE and Moro. If you have a vacuum pump repair need for a brand not listed, don’t despair– we can fix that, too! We are happy to check out any vacuum pump repair job that you may be in need of. Don’t let repair times eat into your business profits–let us help you with vacuum pump repair, so you can get back to helping your customers. When you are in need of vacuum truck repairs and other services, it is essential that you have a knowledgeable repairman to help you. That’s where our experts at Pat’s Pump & Blower come in! We guarantee that we can help you solve any of your vacuum truck repair issues that might come up in your line of work. Contact us today at our Orlando, Florida location with your vacuum truck repair needs or any questions you might have.